I don’t have much to compare them with and I’m no runner bean expert but I get the feeling that my runner beans are lagging behind a bit. August is just a weekend away but there doesn’t seem to be as much growth as I had expected. There has been up to 3 feet of growth winding up the poles but none of that growth has anything much in the way of side growth (leaves, etc). 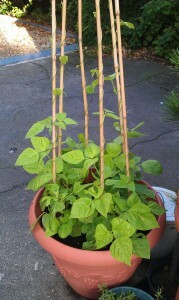 First job would seem to be some research into runner bean development to gauge the performance so far. I think an important lesson has already been learnt because I realise that if the growth I was expecting had materialised then they were obviously planted far too close together! The tub was filled with brand new compost so perhaps that had some negative impact on things? The other aspect could be watering as I know that tubs need regular attention but with all the rain lately I assumed that side of things was dealt with. If I knew what I was talking about I might suspect that the excessive rainfall has washed away the nutrients in the pot so I should add feed occasionally. Of course I have no idea and I’m just guessing but I might do that anyway. One thing seems certain though as the picture shows, there is some wildlife taking chunks from the leaves. I’ll need to keep checking the plants to find out the exact cause though but I’m not interested in spraying chemicals and such like. 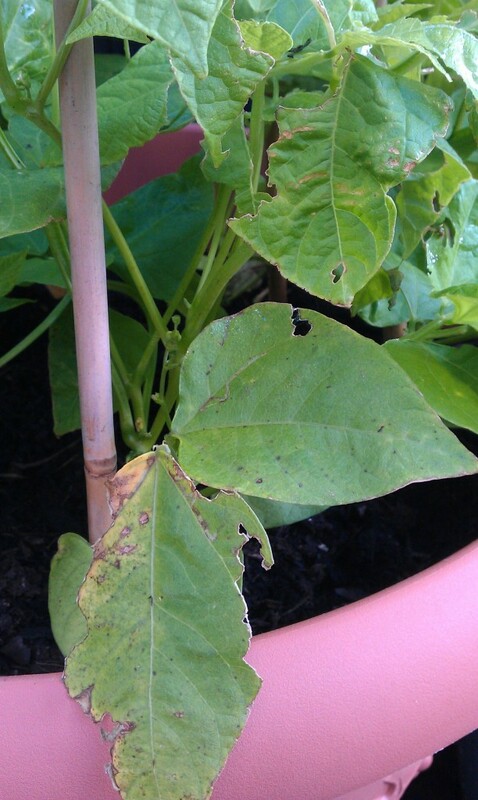 It’s not that I’m a great organic fan or a staunch non-chemical gardener, it’s just that at this stage I’d like to know more about what is going on and the typical problems that can arise. Later on I can look into the various solutions available and pick a suitable line of attack at that time. There’s still plenty of time left for everything to come good and I’m too much of an optimist to lose hope at this stage. If all else fails there are some seedlings in what was the potato patch and these are a month or so behind these so all is not lost.